N Singh, N Sharma. Diclofenac sodium threat to scavenger’s: Get alarmed at the hierarchal decline from vultures to crow and crow to cattle egret. The Internet Journal of Veterinary Medicine. 2008 Volume 6 Number 1. Diclofenac is widely used in human medicine globally, but was introduced to the veterinary market on the Indian subcontinent during the early 1990s. The drug was cheap and was used widely as analgesic, anti-inflammatory and anti-pyretic in the treatment of inflammation, pain and fever in livestock. The tissues of livestock treated with the standard veterinary dose of diclofenac shortly before death were lethal to captive vultures and that a high proportion of wild vultures. Several reports have been published from Asia as well as other parts of the world. 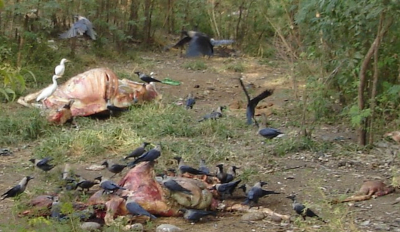 Now as the population of vultures has declined, population of crows, egret (Figure 3), rats and dogs (next line of scavengers) have increased at the site of carcasses. These birds were earlier last to arrive at the site of any dead bodies which have now become the first line/ next batch of scavengers and thereby putting themselves at the verge of extinction. Domestic animals in south Asia were routinely treated with diclofenac to relieve fever, inflammation, and pain and vultures that consumed carcasses of these animals developed kidney failure and visceral gout was reported previously. Based on skull, beak, and mandibular morphologies, griffon vultures fall into the behavioral category of “gulpers” (Figure 1. ), and feed primarily on the viscera and muscles of ungulate carcasses (Hertel, 1994). Diclofenac is widely used in human medicine globally, but was introduced to the veterinary market on the Indian subcontinent during the early 1990s. The drug was cheap and was used widely as analgesic, anti-inflammatory and anti-pyretic in the treatment of inflammation, pain and fever in livestock. Taggart and colleagues (2007) tested liver samples from various carcasses of livestock and found significant concentration of diclofenac in them. A study further conducted by Oaks et al. (2004) of the Peregrine Fund showed that tissues of livestock treated with the standard veterinary dose of diclofenac shortly before death were lethal to captive vultures and that a high proportion of wild vultures found dead in Pakistan were contaminated with diclofenac and had the same symptoms of kidney failure and visceral gout as the poisoned captive birds in the scientific experiments. Early symptoms of affected birds showed their heads hanging down to their feet for longer periods. Recent studies have shown that even at 10 per cent of the recommended dose for mammals, diclofenac was lethal to vultures. However, new research published in Nature in January 2004 further confirmed that veterinary use of diclofenac was responsible for the recent devastating declines in south Asian vulture populations (Figure 2.) (It was carried out jointly by the Ornithological Society of Pakistan and the Peregrine Fund.) Of 259 dead birds examined, scientists found out of that 85 per cent of the deaths were caused by visceral gout, a medical condition induced by renal failure. Heavy metal poisoning or pesticide poisoning was not found. All the vultures’ dead by visceral gout were tested positive for diclofenac. Diclofenac are biologically excreted within a few days by mammals which means that a very high proportion of the cattle scavenged by vultures would need to have been treated with diclofenac within a few days of death for the drug to be present in quantities toxic to the birds. These are few contradictions which need to be solved and addressed. Now as the population of vultures has declined, population of crows, egret (Figure 3), rats and dogs (next line of scavengers) have increased at the site of carcasses. These birds were earlier last to arrive at the site of any dead bodies which have now become the first line/ next batch of scavengers and thereby putting themselves at the verge of extinction. Though wide range of hypotheses have been proposed to explain the population decline in birds. These include reduction in food availability, loss of suitable nesting habitat, pesticide intoxication, deliberate poisoning, emerging infectious diseases and calcium deficiency (Prakash, 1999). All over the sub-continent, vultures were found near human habitation and used to feed on dead animals laid out in the open after skinning the hide. They are an integral part of urban and village landscape. Their absence in some regions (Asian continent) having catastrophic impact on the health of the environment. When vultures are no longer around, carcasses will decay and lead to the outbreak of TB, anthrax and foot-and-mouth disease. 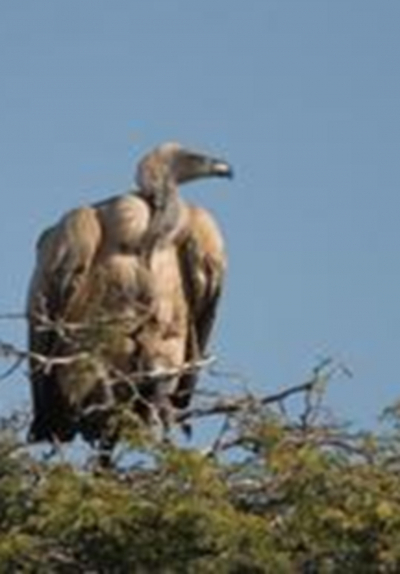 Vultures are now replaced by less favored scavengers like crows, cattle egret, rats and dogs etc. When vultures did not withstand/or resist to diclofenac toxicity, it would be really hard to resist the toxicity of diclofenac or any other NSAIDS by the second line of scavengers i.e. crows, cattle egret etc. It is known that diclofenac has been banned all over India but the other NSAIDS which are in practice needs to tested for its pharmacological toxicities and residual effects. Hierarchal decline of flesh eating birds should be considered alarming and we have to pay extra attention and efforts to protect next line of scavengers. Had the practice of different forms of toxic NSAIDS are not banned around in India, would definitely take us to the time where there will introduction of next batch of scavengers soon after the crows and cattle egrets gets vanished from this ecosystem. r-0. Hertel, F. (1994). Diversity in body size and feeding morphology within past and present vulture assemblages. Ecology 75(4), 1074-1084.
r-2. Prakash, V. (1999). Status of vultures in keoladeo national park, bharat pur, rajasthan, with speical refernce to population crash in gyps species. J. Bombay Ntrl. Hist. Soc. 96: 365-378.
r-3. Taggart, M.A., K.R. Senacha, R.E. Green, Y.V. Jhala, B. Raghavan, A.R. Rahmani, R. Cuthbert, D.J. Pain, and A.A. Meharg (2007). 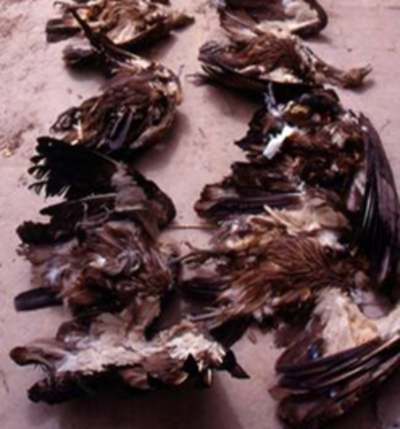 Diclofenac residues in carcasses of domestic ungulates available to vultures in india. Environmental Internatl. 33, 759-765.